The The 41patients with the neurologic displays of an osteochondrosis of a spine column lumbar department (compression-ischemic syndrome), including 26 inhabitants from the northern territories (Komi Republic) and 15 patients of the control group (the Pskov area) are surveyed. Research does not reveal essential distinctions in clinical current of the neurologic displays of the defeat of a spine column lumbar department at inhabitants of northern territories and an average strip. The quantitative mark estimation of a painful syndrome and a condition of the patients does not testify about the negative influence of the extreme climatic conditions on current radiculopathy. Comparison of results of testing before and after a rate of therapy speaks about efficiency of spent treatment. Грибанов А. В., Данилова Р. И. Общая характеристика кли- мато-географических условий Русского Севера и адаптивных реакций человека в холодной климатической зоне (обзор) = Total characteristic of climate-geographical conditions of Russian North and adaptive reactions of human in a cold climatic zone (survey) // Сб. науч. тр. Помор. Междунар. пед. ун-т. - 1994. - № 1. - С. 4 - 27. Казначеев В.П. Очерки теории и практики экологии человека. - М.: Наука, 1983. - 261 с.
Попелянский Я.Ю. Болезни периферической нервной системы. М.: МЕДпресс-информ, 2005. - 463 с.
Скоромец А.А., Скоромец А.П., Скоромец Т.А., Тиссен Т.П. Спинальная ангионеврология. Руководство для врачей. СПб., М: МЕДпресс-информ, 2003. 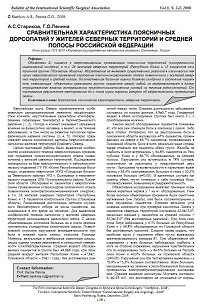 - 608 с.
Kanamiya T., Kida H., Seki M., Aizawa T., Tabata S. Effect of lumbar disc herniation on clinical symptoms in lateral recess syndrome //Clin. Orthop. - 2002. - Vol. 398. - Р. 131 - 135.